In March 2007 at the Victoria and Albert Museum in London we hosted an evening of animation related events which I took as an opportunity to make some more examples of my Phonographantasmascope, an extension of the Zoetrope principle. Watch it shred other bulky objects here. Unlike humans, horses can only breathe through their nose. During exercise when horses begin to breathe hard the soft tissues overlying the nasal passages are sucked in, reducing the airway diameter. This reduction in diameter causes greater resistance to airflow into the lungs. FLAIR Strips are proven to reduce airway resistance during exercise. By reducing airway resistance during exercise, FLAIR Strips are a horse care product that helps prevent fatigue related injuries, helps protect the lungs from injury and promotes optimal athletic performance. This map lets you see where you would end up if you tunneled straight down from where you are now. I come out in the Indian Ocean between Australia and South Africa. The average student has a visual analog pain scale level of 4.3 with some reaching an 8-9, as reported by Northeastern University in June of 2001. From a survey by the American Academy of Orthopedics: 71% of doctors feel backpacks are a clinical problem, 58% see patients with pain related to backpacks, and 52% think that this is a serious problem. 55% of students carry an overloaded backpack, as reported by Simmons College in February of 2001. 3,300 children aged 5-14 were treated in emergency rooms in 1997 for backpack related injuries according to the Consumer Product Safety Commission. An Auburn University study showed that 67% of children suffered muscle soreness, 51% back pain, 24% numbness and 15% shoulder pain. 65% of adolescents’ doctor visits are due to backpack injuries as reported by National Public Radio in October of 1998. Here's a company that has suspension-loaded backpacks which recover energy from walking as well. US company Moller International has begun to manufacture parts for its Jetsons-like personal flying pod, the M200G Volantor. . . . The flying saucer is designed to fly at an altitude of up to three metres, where it benefits from extra lift created by a cushion of air - known as ground effect. Moller's been turning out "real soon now" press releases, and not much else, for a long, long time. The SEC is Not Amused. It weighs only 30 pounds and can be fully weaponized for assault and rescue. 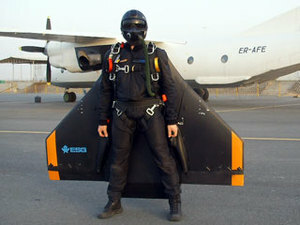 It has a 6-foot jet-wing that is steered with handheld rotary controls connected to its rudder. And it can hide more than 100 pounds of combat gear in a built-in compartment. The Gryphon attack glider, designed to penetrate combat zones at 135 miles per hour, could revolutionize the art of parachuting.